Lookout Cruises offers daily sailing excursions departing historic Beaufort for up to 42 passengers on a 45-foot catamaran with cushioned seating, plenty of shade and large clean restrooms on board. 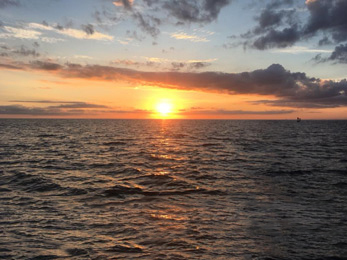 Whether it’s two people, a family outing, tour group or business party, Lookout Cruises offers a memorable sail on the NC Coast complete with cool breezes, saltwater and breathtaking scenery. So make your reservations today for one of these unforgettable Lookout Cruises! Lookout Cruises offers a daily morning sail up the Newport River to a place where the dolphin come to play year after year. 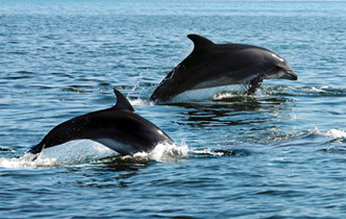 These dolphin are familiar friends to Lookout Cruises. Recognized by their individual dorsal fins, we’ve even named a few! Just a few feet from the boat, you can watch the dolphin playing together in their natural habitat. We join them every morning and you can, too! This trip is great for adults and children of all ages. The cruise departs daily from the Beaufort waterfront at 9:20 am and returns at 11:15 am. 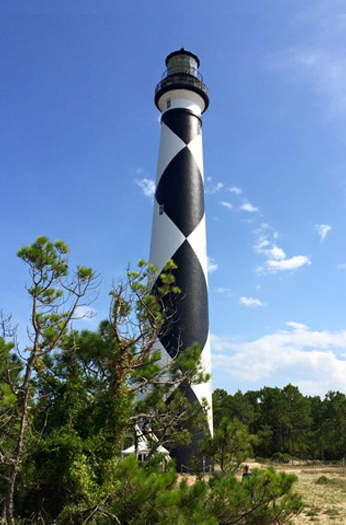 The beauty of the Cape Lookout lighthouse and its pristine surroundings is unparalleled. You’ll really appreciate the stability and comfort of this 45-foot catamaran as we briskly make the six mile ocean voyage to one of the premier anchorages in America. Our 6 hour cruise departs at 12 noon for the 1-1/2 hour sail to Cape Lookout where you’ll enjoy 3 hours at two different locations. For our first stop at the tip of Cape Lookout, we beach the boat and serve up a delicious catered lunch from the Beaufort Grocery Co. Restaurant. When you taste their signature sandwiches, salads and desserts, you’ll see why locals and visitors alike have made Beaufort Grocery Co. a favorite. On board stairs offer easy access on and off the boat for unbelievable swimming, snorkeling (bring your own equipment) and some of the best shelling on the East Coast. Large clean restrooms and a freshwater deck shower are provided. We then tie up at the government dock for our second stop allowing time to visit the Keeper’s Quarters museum, the National Park store and the east beach of South Core Banks. While here you can get spectacular photos of the Lighthouse and on specific days you may climb the 160’ tower. Our trip departs each evening for a 7-8:30 pm cruise that promises a view to take your breath away. The red and yellow North Carolina sunsets are some of the most beautiful in the world, and they’re yours to enjoy as we sail from the Beaufort waterfront into the gentle breezes of early evening. With friends or family, it’s a terrific way to wrap up the day! The cruise includes complimentary beverages. 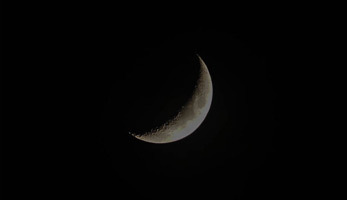 Become acquainted with the night as the moon guides our cruise out into the peaceful waters surrounding historic Beaufort. The 9-10:30 pm cruise runs only during the full moon period, so you’re guaranteed the beauty and tranquility that comes with a perfect moonlit evening. At the end of the night, we’ll return you to the Beaufort harbor, a jewel in the night with its lights and historic skyline. Come with us for a night you’re sure to remember. This cruise includes complimentary beverages.